Sir George Thomas Beatson was a pioneer in the field of oncology and is widely regarded as one of the most influential figures in the treatment of cancer. The Beatson West of Scotland Cancer Centre and the Cancer Research UK Beatson Institute are named for him. Beatson was born in Trincolmalee, Sri Lanka, but raised in Campbeltown, Scotland. He was the son of George Stewart Beatson, a notable doctor who had served as Honorary Physician to Queen Victoria and Surgeon General to the Indian Army. Beatson received his early education at King William’s College, and went on to study at Clare College, Cambridge, graduating BA in 1874. He then attended the University of Edinburgh, graduating MB in 1874 and MD in 1878. His final thesis focused on the links between ovulation, lactation and cancer. After graduating, Beatson worked with Joseph Lister, the pioneer of antiseptic surgery. 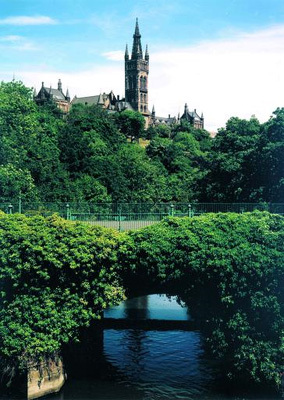 In 1878 Beatson moved to Glasgow, taking up the position of assistant to Sir George Husband Baird Macleod. Around this time he was also appointed a surgeon to the dispensary for out-patients at the Western Infirmary , and was promoted to visiting surgeon in 1900, and again to honorary consulting surgeon in 1913. In addition to his work at the Western Infirmary, in 1893 he became a consulting surgeon at the Glasgow Cancer and Skin Institute, renamed the Glasgow Cancer Hospital in 1894. It was here where he established an innovative domiciliary service, which supplied nursing care to patients in their own homes. In 1896 he published a paper entitled On Treatment of Inoperable Cases of Carcinoma of the Mamma: Suggestions for a New Method of Treatment, with Illustrative Cases . This detailed his pioneering treatment of three patients with advanced breast cancer through bilateral oophorectomy (removal of the ovaries), which became the standard treatment for advanced breast cancer over the following years. He was the first to describe remissions of metastatic breast cancer after this operation and is considered the father of anti-hormonal treatment of breast cancer. Beatson was also a military man, having joined the 1st Lanark Artillery, a unit of the Volunteer Forces, as Volunteer Medical officer in 1979. He took charge of the Glasgow Company of the Volunteer Medical Staff Corps in 1891, and played a key role in establishing the St Andrew’s Ambulance Association. During his long and active career Beatson was awarded many honours and decorations, such as a CB in 1902 and a KCB in 1907. He also served as the Deputy Lieutenant of the County of the City of Glasgow, and was the Glasgow correspondent for the British Medical journal.